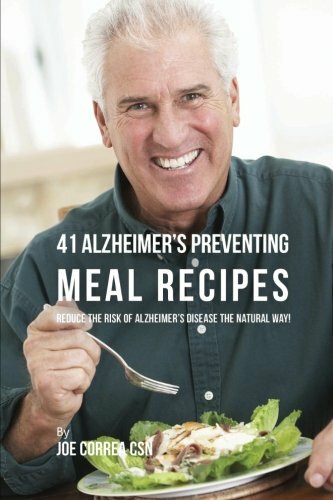 Synopsis: 41 Alzheimer's Preventing Meal Recipes: Reduce the Risk of Alzheimer's Disease the Natural Way! Authored by Joe Correa CSN Alzheimer's disease is a devastating brain disease that can happen to anyone. Alzheimer's begins as simple forgetfulness. Gradually, over time this disease can destroy speech and comprehension in addition to causing restlessness and dramatic mood swings. While this is difficult for loved ones, these symptoms are more difficult for the patient. However, with the right diet the onset of Alzheimer can be delayed and you can lower the risk of Alzheimer's. The dietary change is simple. Increasing consumption of omega3s, vitamins A, B, C, E, and K, and foods rich in folate, phosphorous, magnesium, and selenium. These foods include nuts, seeds, leafy greens, and fish. Many spices, such as curry and turmeric contain several of these essential vitamins allowing food to explode with flavor. Use these recipes to reduce the risk of Alzheimer's disease and as a guide for a healthier diet and lifestyle. You will truly enjoy them! About the Author&colon; After years of research, I honestly believe in the positive effects that proper nutrition can have over the body and mind. My knowledge and experience has helped me live healthier throughout the years and which I have shared with family and friends. The more you know about eating and drinking healthier, the sooner you will want to change your life and eating habits. Nutrition is a key part in the process of being healthy and living longer so get started today. The first step is the most important and the most significant. 1. 41 Alzheimer's Preventing Meal Recipes: Reduce the Risk of Alzheimer's Disease the Natural Way! 2. 41 Alzheimer's Preventing Meal Recipes: Reduce the Risk of Alzheimer's Disease the Natural Way! 5. 41 Alzheimer's Preventing Meal Recipes: Reduce the Risk of Alzheimer's Disease the Natural Way!